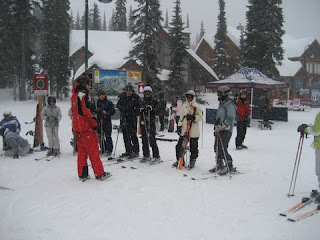 That's me in the blue coat getting ready for ski school. 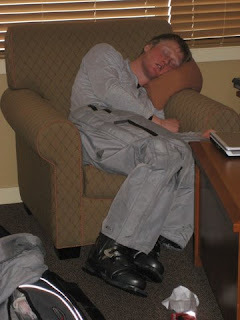 Greg wanted to be ready to go when the rest of the family was going skiing so he left his boots on for the duration of his nap. What a couple of cuties! I love this picture: Notice how Alex and Megan are comfortably dressed in lightweight shirts. Megan is just wearing a tee shirt. 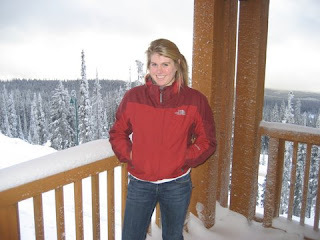 And then you have the southern California resident over there on the left-hand side wearing a long sleeve cotton shirt, a cashmere sweater, and a warm jacket. You can't see it in the picture but my hat and gloves are also close at hand. Typical. Greg was a fabulous driver, navigating through several treacherous snowy passes and past an overturned semi-truck on the road. 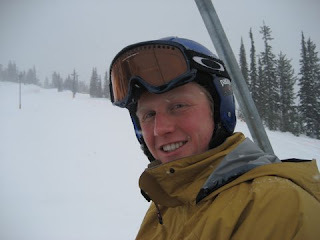 We traveled up to Big White, Canada for a weekend of skiing with the family. 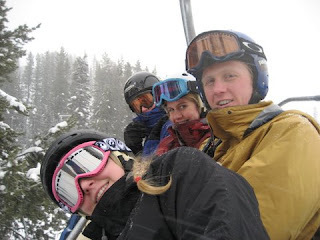 I am a long time snow-boarder but decided to learn how to ski since I was the lone boarder of the group. Chris taught me the basics and then I took a couple of lessons. I am now a master of the bunny hill! We had a delightful time and I am a proud owner of several apple-sized bruises. It's been almost seven months since we spent time with Bob and Cherie (at the wedding) and it was nice to finally catch up.